The ExactSteam V-Cone system’s innovative design delivers repeatable accuracy of +/- 0.5% of rate with up to a 50:1 turn-down under the most challenging flow conditions. Readings are always precise and reliable, even under changing process parameters. With this unique ability to self-condition flow, the ExactSteam V-Cone system virtually eliminates the need for upstream or downstream straight pipe runs. The ExactSteam V-Cone can be installed virtually anywhere in a piping system or easily retrofitted into an existing piping layout, resulting in significant installation flexibility and cost savings. In addition, the ExactSteam V-Cone has been proven to provide stable, reliable performance with exceptional longevity. 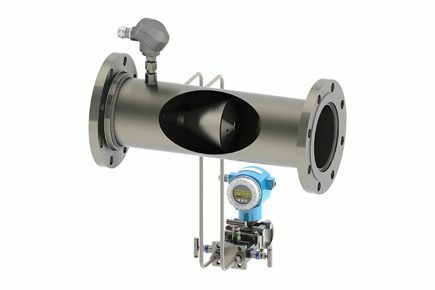 The ideal solution for steam flow measurement is McCrometer’s ExactSteam V-Cone, a complete flowmeter factory configured for energy metering or mass flow. The ExactSteam V-Cone accurately measures steam across the entire application range with technology-leading low flow cut off, and acts as its own flow conditioner by disrupting all centralized flow disturbances. The ExactSteam V-Cone can measure Superheated (dry), Superheated and Unsaturated (wet) steam. McCrometer V-Cone Flow Meters are sometimes referred to as ‘McCrometer VCone Flow Meters’ and ‘McCrometer V Cone Flow Meters’.